We are already looking forward to offering several options for how to enjoy our flowers in 2019! First and foremost, our bouquets will be available in multiple sizes and price points throughout the season at all of our farmers markets alongside our veggies. For a weekly bouquet for 12 weeks of high summer, please consider our Flower Share. We are always happy to connect with designers that prioritize locally-sourced and organically-grown flowers for events, and can supply flowers by the bucket and/or by the stem depending on what is best for your event. Email us at fourrootfarm@gmail.com for information about selection, availability, and pricing. We also love working with brides, local businesses, or restaurants who are interested in doing their own arrangements. We will provide custom buckets of flowers at wholesale prices for DIY arrangements at your next garden wedding, baby shower, office party, or bridal shower. How it works: you let us know at least one week in advance when you'd like to pick up the buckets (at the farm or at any of our markets), and if you have a color scheme in mind. 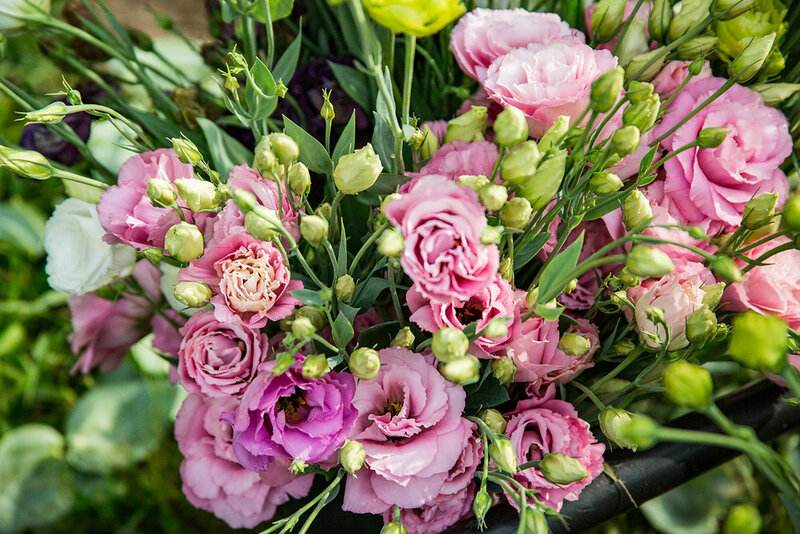 We harvest a bucket of flowers suitable for centerpiece arrangements including a mix of focal flowers and greenery. One bucket will be enough to make about 6-8 small to medium mason jar arrangements. Availability of specific flowers is subject to seasonal variables, though we will always do our best to accommodate specific requests. Dahlias and a few other specialty flowers will be an additional per-stem cost. We offer floral design for local events on a limited schedule through the season. Email us at fourrootfarm@gmail.com to get on our calendar early, and for information about pricing. Please include in your email the date, location, and size of your event.